Primary biliary cirrhosis (PBC) is an autoimmune disease of progressive intrahepatic cholestasia, characterized by chronic nonsuppurative destructive granulomatous cholangitis leading to bile duct loss, fibrosis, and eventually cirrhosis of the liver. Diagnosis is based on a combination of clinical features, a cholestatic pattern indicating abnormal liver function, and the presence of antimitochondrial antibodies in the serum. The incidence and prevalence rates are higher in countries in the northern hemisphere, such as the United Kingdom, Scandinavia, Canada, and the United States, but the disease does affect different races.1 One of the clinical characteristics of PBC is its association with various autoimmune disorders. However, the association of PBC with pernicious anemia (PA) has seldom been reported; therefore, the diagnosis of PA in PBC patients might be overlooked. A 46-year-old woman was admitted to hospital because of progressive jaundice, malaise, and distal paresthesia (peripheral neuropathy). The results of biochemistry tests were as follows: serum aspartate aminotransferase, 157 U/L (normal range < 31 U/L); alanine aminotransferase, 169 U/L (normal range, < 31 U/L); total and direct bilirubin, 12.44/7.91 mg/dL, (normal range 0.2 to 1.2/< 0.4 mg/dL); international normalized ratio, 1.14 (normal range 0.8 to 1.2); and albumin, 3.7 g/dL (normal range 3.5 to 5.0 g/dL). She did not report clay-coloured stools, fever, or abdominal pain during the course of the illness. Her past medical and family histories were unremarkable. She was not taking any medications before onset of symptoms. At presentation, she was well nourished but looked generally weak. Physical examination revealed icteric sclerae and pale conjunctivae, but there was no hepatosplenomegaly. Laboratory test results confirmed the presence of direct-type hyperbilirubinemia (Table 12–7) and revealed cholestatic hepatic injury with predominant elevation of serum alkaline phosphatase and γ-glutamyl transpeptidase relative to serum aminotransferase levels. The patient’s hemogram results revealed macrocytic anemia (hemoglobin, 105 g/L [normal range 113 to 153 g/L]; mean corpuscular volume, 114.8 fL [normal range 79 to 99 fL]). Abdominal ultrasonography and magnetic resonance cholangiopancreatography disclosed cirrhosis of the liver but ruled out biliary obstruction. Serologic test results for viral hepatitis B and C were negative, but test results for antinuclear antibodies (1:640) and antimitochondrial antibodies (1:20) were positive. Elevated levels of immunoglobulin M (1040 mg/dL [normal range, 88.37 to 232.77 mg/dL]) were noted. 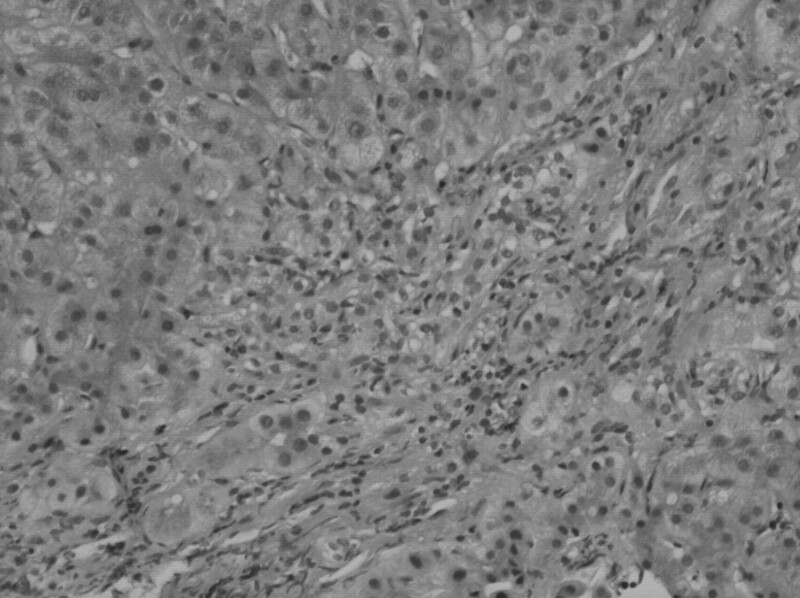 Liver biopsy showed portal fibrosis, marked ductular proliferation, and lymphoplasmacytic infiltration (Figure 1). The patient was diagnosed with PBC at Scheuer stage II (early stages, I and II; advanced stages, III and IV). Ursodeoxycholic acid (600 mg daily, taken orally) was prescribed. The initial dose of ursodeoxycholic acid was slightly lower (about 12.2 mg/kg). However, the patient’s body weight decreased from 49 kg to 45 kg. Therefore, there was no further adjustment past 600 mg daily. Liver biopsy revealed expanded portal areas, portal fibrosis, lymphoplasmacytic infiltration, and ductular proliferation: hematoxylin and eosin stain, magnification × 100. Clinical characteristics of 9 cases of PBC associated with PA reported in the literature: All patients were female. To differentiate between macrocytic anemia and PA, a peripheral blood smear was done, which revealed anisocytosis, macro-ovalocytes with tailed red blood cells, and hypersegmented neutrophils (Figure 2). Vitamin B12 deficiency (serum level, 119 pg/mL [normal range 239 to 931 pg/mL]) and the presence of antiparietal cell antibodies (1:20) favoured the diagnosis of PA. An upper gastrointestinal endoscopy demonstrated pale yellowish mucosa with transparent blood vessels at the gastric body, and a biopsy disclosed atrophic gastritis with intestinal metaplasia. With the diagnosis of PA, the patient received intramuscular injections of vitamin B12 (1000 μg weekly for 2 months, then 1000 μg monthly over a long-term period). Her anemia substantially improved after medical treatment; however, she still had progressive jaundice, moderate to severe ascites, and intermittent sepsis. She passed away 3 years after the diagnosis of PBC while awaiting liver transplantation. 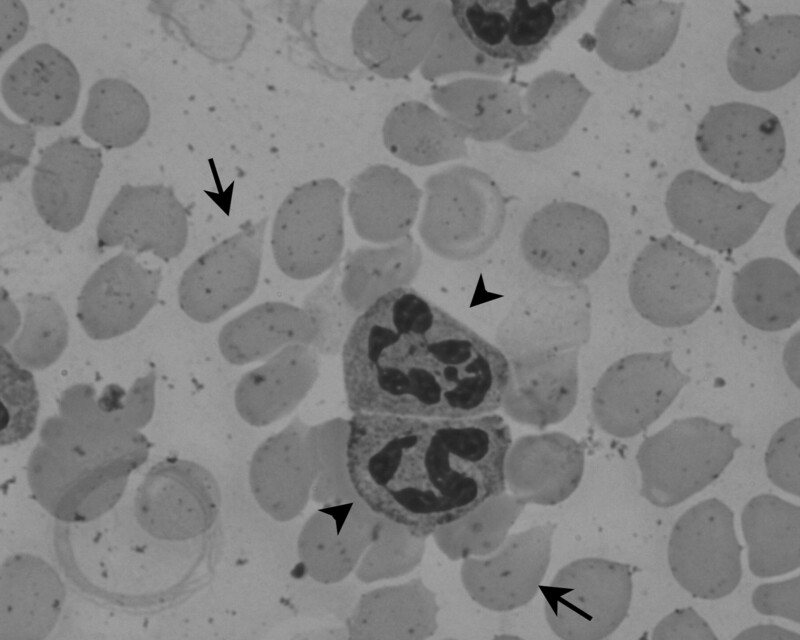 Peripheral blood smear: The arrows indicate the macro-ovalocytes with tailed red blood cells; the arrowheads identify the hypersegmented neutrophils. One of the characteristics of PBC is its association with various kinds of autoimmune disorders, such as Sjögren syndrome,8 scleroderma, CREST (calcinosis, Raynaud phenomenon, esophageal mobility disorder, sclerodactyly, and telangiectasia) syndrome, rheumatoid arthritis, systemic lupus erythematosus, chronic thyroiditis, and interstitial pneumonitis.1,9 The disease most frequently associated with PBC is Sjögren syndrome, which is reported in approximately 70% to 80% of patients with PBC.8 Pernicious anemia is often associated with other autoimmune disorders as well, such as Hashimoto thyroiditis, Addison disease, and insulin-dependent diabetes mellitus.10 However, its association with PA is infrequent. The incidence of PBC associated with PA has not been well understood, but Culp et al observed a link between these 2 disorders in 2 of 113 (1.8%) patients with PBC.9 Case reports describing the association of PA with PBC in the literature are rare. The first case of PBC associated with PA was reported in 1980 by Renoux et al.2 Between the case described above and our literature review, we found a total of 9 patients affected with PBC and PA; they were all women whose ages ranged from 46 to 72 years (Table 1).2–7 The mean age was 59.4 years, which is approximately the peak age of onset of PA and older than the mean age of onset of PBC. Most of the patients initially presented with pruritus, and only 2 of the 8 patients had symptoms of anemia (ie, dyspnea and fatigue). The length of time between the first signs of PBC and PA varied widely—the 2 conditions sometimes appeared simultaneously, but often months to years passed from the onset of the first condition to the onset of the second. This case illustrates the possible association between PBC and PA. As mild anemia is usually asymptomatic and easily overlooked, clinicians caring for PBC patients should keep a high index of suspicion for coexisting PA when macrocytic anemia is present. Effective therapies are available for both PBC and PA and underscore the importance of correct diagnosis. If PA is left untreated, serious nerve, heart, brain, and digestive tract complications might occur. To avoid overlooking macrocytic anemia in patients with PBC, family physicians should actively look for PA in patients with PBC. Primary biliary cirrhosis (PBC) is a chronic and progressive intrahepatic cholestasia of autoimmune etiology; typical clinical manifestations include a cholestatic pattern indicating abnormal liver function and the presence of antimitochondrial antibodies in the blood serum. Pernicious anemia (PA) is an immune-mediated disorder characterized by impaired absorption of vitamin B12 owing to lack of intrinsic factor. Primary biliary cirrhosis is often associated with other autoimmune disorders, most frequently Sjögren syndrome. The incidence of PA in patients with PBC is about 1.8%, and the cross-reactivity of autoantibodies to common antigens in the liver and the stomach might underlie the pathogenesis. In patients with PBC who present with anemia, a thorough investigation for PA should be considered. La cirrhose biliaire primitive (CBP) est une cholestase intrahépatique chronique et progressive d’étiologie auto-immune; parmi ses manifestations cliniques typiques, il y a une tendance cholestatique indiquant un fonctionnement anormal du foie et la présence d’anti-corps anti-mitochondries dans le sérum sanguin. L’anémie pernicieuse (AP) est un trouble à médiation immunologique caractérisé par une absorption déficiente de vitamine B12 en raison d’un manque de facteur intrinsèque. La cirrhose biliaire primitive est souvent associée à d’autres maladies auto-immunes, le plus souvent au syndrome de Sjögren. L’incidence de l’AP chez les patients ayant une CBP est d’environ 1,8 % et la réactivité croisée des auto-anticorps aux antigènes communs dans le foie et l’estomac pourraient être à la source de la pathogenèse. Chez les patients ayant une CBP qui se présentent avec de l’anémie, il faut envisager une investigation approfondie de l’AP.
. Primary biliary cirrhosis. Orphanet J Rare Dis 2008;3:1.
. Primary biliary cirrhosis and pernicious anemia. A fortuitous association? [article in French]. Gastroenterol Clin Biol 1980;4(2):109-13.
. Pernicious anemia in a patient with primary biliary cirrhosis [article in German]. Wien Med Wochenschr 1994;144(17):426-8.
. A case of primary biliary cirrhosis associated with pernicious anemia [article in Japanese]. Nippon Shokakibyo Gakkai Zasshi 1999;96(5):545-9.
. A female with asymptomatic primary biliary cirrhosis associated with pernicious anemia. J Gastroenterol Hepatol 2001;16(12):1420-4.
. A rare association of primary biliary cirrhosis and pernicious anemia. J Gastroenterol 2002;37(7):560-3.
. Primary biliary cirrhosis associated with pernicious anemia. A case report. Can Fam Physician 2010;55:889-91.
. Sjögren’s syndrome in patients with primary biliary cirrhosis. Hepatology 1990;11(5):730-4.
. Autoimmune associations in primary biliary cirrhosis. Mayo Clin Proc 1982;57(6):365-70.
. Pernicious anemia. N Engl J Med 1997;337(20):1441-8.